사향노루는 사슴과 중에서도 가장 원시적인 동물로 한국, 중국, 중앙아시아, 사할린, 시베리아, 몽고 등지에 분포한다. 몸길이 65∼87㎝, 키 75∼105㎝로 암수 모두 뿔이 없고, 위턱의 송곳니는 길게 자라서 입밖으로 튀어나와 있다. 귀는 비교적 크고 다리는 짧으며, 발굽이 작고 꼬리가 매우 짧아 겉에서는 잘 보이지 않는다. 몸의 털색은 전체적으로 물결모양의 다갈색이고, 흰색 띠가 두 눈으로부터 목의 좌우, 앞가슴을 지나 앞다리 안쪽까지 내려가 있다. 대개 바위가 많은 해발 1,000m 이상의 높은 산에서 서식하며, 바위나 나무껍질에 붙어사는 식물과 풀, 키가 작은 나무의 어린 싹과 잎, 열매 등을 먹는다. 1∼2마리의 새끼를 낳고, 단독 또는 암컷이 새끼와 함께 생활한다. 청각과 시각이 잘 발달되어 있으며, 겁이 많은 편이다. 배쪽에 사향주머니가 있는 수컷은, 교미시기에 암컷을 유인하기 위해 이곳에서 냄새를 풍긴다. 사향은 동물성 향료 및 약재로 가장 비싸게 쓰이기 때문에 마구 잡아 들여서 현재는 그 수가 급격히 감소하였다. 사향노루는 계속되는 사냥과 생태계 파괴로 인해 멸종위기에 있는 동물이므로 천연기념물로 지정하여 보호하고 있다. As the most primitive animal in the deer family, the musk deer lives in Korea, China, Central Asia, Sahalin, Siberia, and Mongolia. It is about 65-87cm and approximately 75-105cm tall. A musk deer has no horns, with an upper chin as well as long canine teeth. It has rather big ears, four short legs, and small hooves, and its tail is too short to be seen. Its coat is wave-like and yellowish-brown in color. A musk deer has a white band from the two eyes to the inside of its legs. It lives in the high mountains more than 1,000 meters above sea level. It feeds on plants and grass living on the rocks and on the bark of trees or buds, leaves, and fruits of small trees. The female usually produces about 1-2 fawns and stays with them. A musk deer has good eyesight and hearing but is rather timid. The male has a musk pocket on the belly, which gives off a scent to lure the female during mating. The musk is expensive because it is used for perfume or medicine. That is why people overharvest it, and the number of musk deer has decreased remarkably. 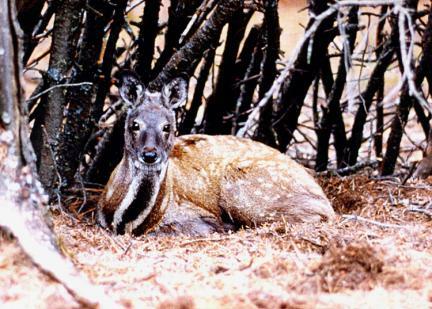 Musk deer are in danger of extinction. Therefore, they are designated and protected as a natural treasure.